Sony Alkaline AA Batteries come in 1000/Case. 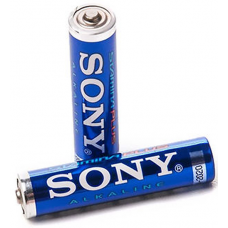 Packaged in bulk.Manufacturer part number: AM3-VPXA, A..
Sony AA Alkaline Batteries, 30/Pack. Packaged in bulk.Manufacturer part number: AM3-VPXA, AM3VXPA, A..
Sony AA Alkaline Batteries, 500/Case. Packaged in bulk.Manufacturer part number: AM3-VPXA, AM3VPXA, ..
98/Carton. Packaged in bulk.Manufacturer part number: AM3-VPXA, AM3VPXA, AM-3ANSI/NEDA: 15AIEC: LR6B..
MPN: AM3-VPXA, AM3VPXA, AM-3ANSI/NEDA: 15AIEC: LR6Get the quality and commitment behind the Sony nam..